Do you know what makes a ride-on mower powerful and versatile? It is the accessories and attachments of the mower. In addition to cutting grass on your lot, you can also clean up the leaves during spring, remove snow during winter, spread seeds and fertilisers, and much more with the help of the right accessories and attachments. Choosing the right ride-on mower attachments and accessories can enhance the capabilities of your mowers and help you to complete your works quicker and efficient. 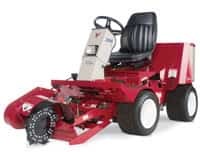 At Ventrac, we offer a range of ride-on mower attachments and accessories that focuson improving the functionality of your mowers significantly. Ventrac offers four categories of products to the customers to make their jobs simple, efficient, and hassle-free. Our range of tractor attachments and accessories are ideal for our 3400 and 4500 series ride-on mowers. All these tractor attachments can be connected to your mowers in less than a minute, without the need of any special tools. These attachments can fit the needs of home owners, landscapers, sporting groups, municipalities, parks, and much more. We also offer salt spreaders, 12-volt switch and plug for various attachments, enclosed cabs for mowers to protect the operators from weather conditions, rear weight brackets, and more. You can also find 2-N-1 for holding weights in the front of the mower, adjustable suspension seat for a smoother ride, dual wheel kits, and hubcaps. Explore our range of accessories and enhance the capabilities of your equipment with smart choices. Call us today on (02) 4625 2308 with your questions on accessories and attachments. Our experts will help you to choose the right accessories and attachments to make your tasks easier. Alternatively, use our contact form to reach out our executives online with your questions.